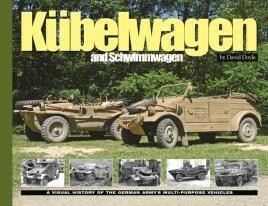 Unfortunately, due to sales rights restrictions, we cannot offer Kubelwagen/Schwimmwagen for sale in your country. The vehicle that was to become the Type 82 Kübelwagen had its roots in the development of the Volkswagen "People's Car.” With war clouds gathering over Europe, the efforts of the Volkswagen facility were turned to the production of military vehicles. In January 1938 work began in earnest on the vehicle that would come to be popularly known as the Kübelwagen. The term Kübelwagen means "bucket car” and was actually applied to a variety of vehicles from a number of makers, but has come to be synonymous with the Volkswagen Type 82. Even under the skilled tutelage of Dr. Ferdinand Porsche, two years of work and testing were required before the Kübelwagen took its classic form. It was soon to become as ubiquitous as the U.S. Army's Jeep and was also designed a produced as an amphibious car known as the Schwimmwagen. As always, this Visual History title mixes rare and interesting archival imagery with photos of restored vehicles. Produced with the full and complete cooperation of the Kübel Korps, one of the world's largest Kübelwagen-Schwimmwagen restoration groups, this title presents only the very finest restored examples. Early examples of the Kübelwagen are featured, as is a very rare 1945 model. No detail is left unrevealed, with interiors, multiple engine views and undercarriages. Additionally, the Schwimmwagen is covered in equally great detail. An absolute must-have in modeler's library. In one book you get all necessary info. Whether you have the Beko or Tamiya Kübelwagen, the Tamiya Shwimmwagen in 1:35 or one of the many models in other scales, this book will give you all the reference pictures and some besides, as well as some inspiration for dioramas. Highly recommended. A mountain of walk-around photos of preserved examples…give the modeller all of the superdetailing cues he or she needs. For anyone with one of the larger scale kits, such as the old 1/9 kit from ESCI or the even bigger 1/6 model from Dragon (they do the Schwimmwagen as well) then this provides a level of detail references that is hard to match. This is certainly a must-have volume for anyone thinking of detailing one of the many Kübelwagen and Schwimmwagen kits out there. Highly recommended. WWII model makers in particular will find this book irresistible. Packed with amazing archive photographs of these iconic German army vehicles.